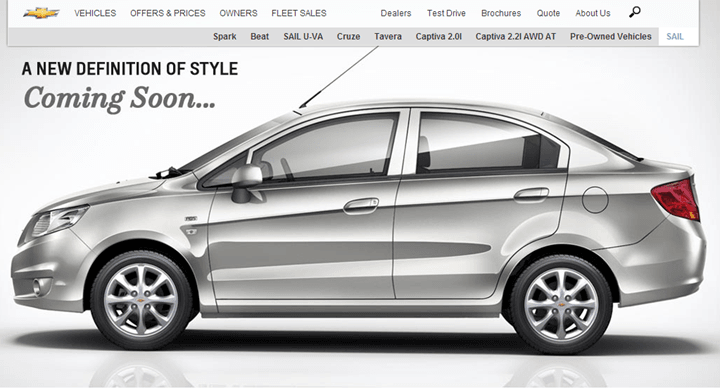 We brought you the story of Chevrolet Sail sedan doing rounds and showed you some spy shots of the upcoming sedan. The test mule had just the badges covered and as is the norm of decreasing the foilage on the cars as the launch nears, it pretty much hints towards an impending launch and if that was not enough, the blokes back at GM have put up the Chevrolet Sail sedan on the Chevrolet Official website with a coming soon tag. “A New Definition of Style- Coming Soon…” is what the website says about the upcoming sedan. The car will be the first launch from the stable of the Americans and shall be followed by the launch of their Enjoy MPV in the coming months. The sedan will be entering a highly competitive segment of the entry level sedans where the VFM factor is the only thing matters. The Swift Dzire has been the leader of the pack for quite some time now with the Etios and Manza joining it at the podium. The Sail sedan shall share a lot of its components with its hatchback sibling and shall be completely indistinguishable from the hatchback version from the front. The Sail go on sale in two engine options with one being a petrol engine and the other being a diesel heart. The petrol engine is a 1.2-litre unit which gives out 84bhp and 113Nm of torque and the diesel offering shall be a 1.3-litre turbo diesel engine giving out a frugal 76bhp and 205Nm of torque.